TUESDAY, Feb. 13, 2018 (HealthDay News) — After losing weight, many dieters soon regain much of what they took off. Now, research hints that chemicals lurking in clothing and furniture may play a role in this frustrating yo-yo cycle. Widely used manmade chemicals called perfluoroalkyl substances (PFAS) may undermine dieters’ attempts to maintain weight loss by slowing down the body’s metabolism, the new study suggests. Sun is an assistant professor of nutrition at the Harvard School of Public Health. Perfluoroalkyl substances have been used for over 60 years in developed countries like the United States. “These chemicals are both water- and oil-repellent,” Sun said. They’re found in many consumer products, including nonstick cookware, waterproof clothing, stain-resistant carpeting and furniture fabrics, and food wrappers. Prior animal research has linked PFAS exposure to weight gain and obesity in animals. This has earned them the nickname “obesogens.” Other studies have also linked them to cancer, hormone disruption, immune dysfunction and high cholesterol. This investigation focused on more than 600 overweight or obese men and women aged 30 to 70. 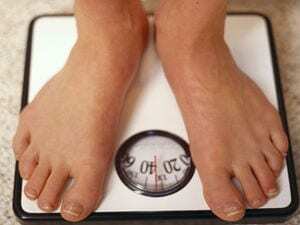 All had participated in a two-year obesity study in the mid-2000s. In the process of tracking the cardiovascular impact of four different diets, the trial measured PFAS exposure at enrollment. On average, participants lost 14 pounds during the first half-year of dieting, but then regained six pounds during the following 18 months. Those with the highest blood levels of PFAS at the start were the most vulnerable to regaining weight. They also had significantly lower post-diet metabolism, or “resting metabolism,” causing them to burn fewer calories throughout the day, according to the study. Women faced the highest risk for PFAS-linked weight gain, the team found. And women in the top one-third in terms of pre-diet PFAS exposure regained roughly four to five pounds more than women in the bottom third. Sun said it’s not clear why women seem more vulnerable, but hormones likely play a role. “We know from animal studies that PFAS can interfere with estrogen metabolism and functionality, and estrogens are amongst hormones that regulate body weight and metabolism,” he said. “Given their ubiquitous existence in the environment and our consumer products, it is challenging to entirely avoid exposures to these chemicals, although choosing products that are free of PFAS can help reduce the exposure,” Sun said. He did say the industry is phasing out some of the chemical compounds, but added the health impact of substitute chemical options remains unclear. “Of course, association does not prove causation, and there would need to be significantly more research,” said Rifai, a clinical assistant professor of medicine at Wayne State University in Detroit. “But this analysis definitely justifies that,” he said. The findings were published online Feb. 13 in PLOS Medicine. There’s more on perfluoroalkyl substances and health at the U.S. Centers for Disease Control and Prevention.